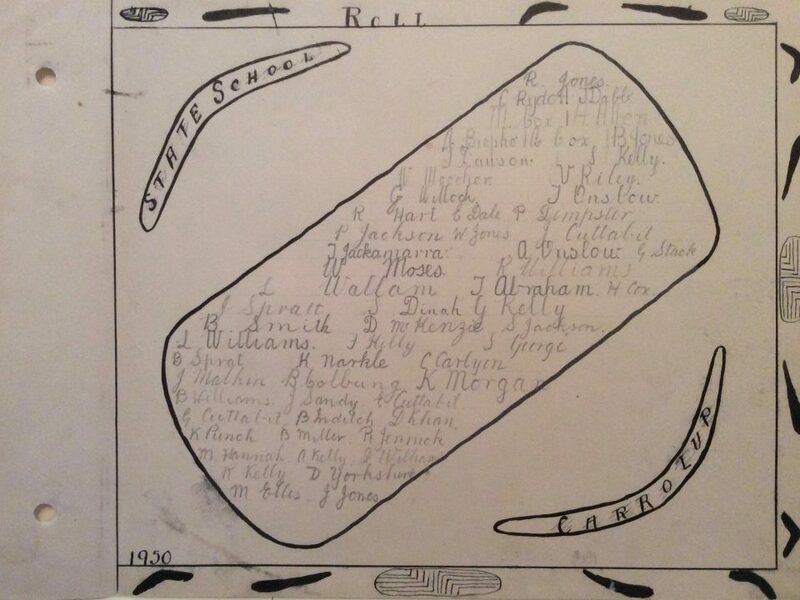 The names of the 59 boys at Carrolup Native Settlement School as shown in a book of their schoolwork given as a present to school inspector Charlie Cook in 1950. Noel & Lily White Collection. Before I moved to Australia at the end of 2008, I lived in a beautiful area of South Wales (UK) for 16 years. In Wales, the most common surname is Jones. I didn’t know any Jones’s! Since starting to investigate the Carrolup Story, Jones’s have started ‘appearing’ in my life, in number! First there was Ross Jones (RIP), one of the better-known Carrolup child artists. I saw photographs of him, found a letter of his sent to Mrs Rutter in the UK, and then wrote about him for the book I had been writing. I met Wazza Jones at a photograph exhibition organised by Robert and Selina Eggington. He was staring intently at a photograph (from the Noel & Lily White Collection) of four Aboriginal boys holding their art at Carrolup in 1950. I asked him if he was all right and he said, ‘I think that boy on the left is my father.’ He then pulled out of a photograph of his father later in life and asked my opinion. I wasn’t sure, but the boy could well have been Wazza’s father. Wazza told me that he knew that his father, Warrick Jones (RIP), was at Carrolup in the late 1940s. However, he didn’t know much of what happened at Carrolup, other than the fact that his father was taken there after being removed from his family. He said that his father often did drawings similar to the one in the photo. Wazza then proceeded to tell me how important it was for his identity to know more about what happened to his father at Carrolup. I was impressed and deeply moved by what he had to say. I told him that I would send him any documents I had in my possession which contained his father’s name. What I sent Wazza showed that Warrick Jones was at Carrolup at least for the period 1948 -1950, possibly even earlier. 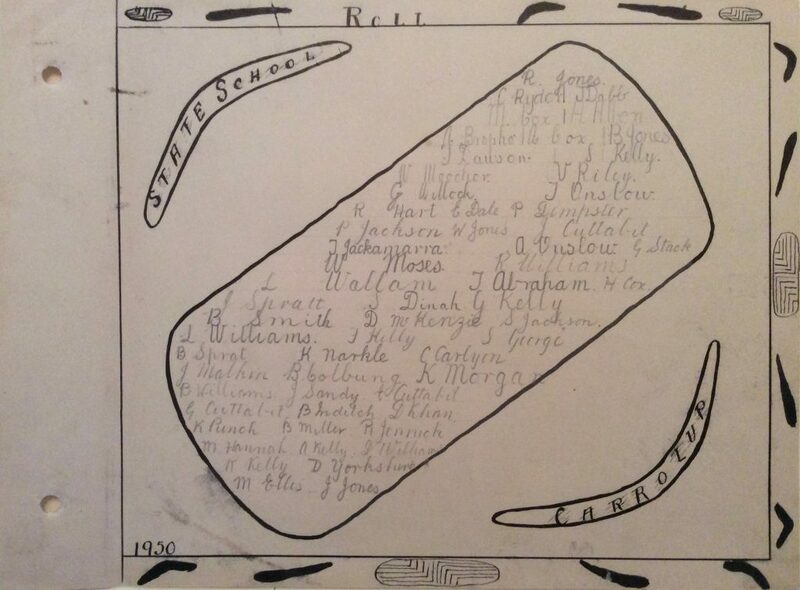 Inspection of the page of the book made for school inspector Charlie Cook by the boys (see above) reveals the names of R Jones (Ross, Top Row), B Jones (4th Row), W Jones (Warrick, 9th Row) and J Jones (Bottom Row). Some months later, I was on my way to the UK. As I approached security to have my ticket checked, I was deep in thought about my children who I would see again in less than 24 hours. As I handed my ticket over, a voice piped up, ‘David, don’t you recognise me?’ I looked up… it was Wazza Jones. We had a good chat, agreeing that we must meet and talk more about Carrolup, in-between Wazza taking passengers’ tickets and wishing them ‘Happy Travels’ in many different languages. Boy, was that impressive! I shared the fb page with some of my family who lived at Carrolup or have family connections to Carrolup. I look forward to having a deeper look into what already from what I’ve seen is an amazing website. Thank you for putting this together. The ways this will help our community affected by what took place at Carrolup and at many other missions around the country will be immeasurable. I soon talked to Wazza’s sister Dale. She first posted a comment on Kaiyu Moura’s Facebook page that I had noticed. Kaiyu, who lives on Stradbroke Island in Queensland, has shared my Sharing Culture website content probably more than anyone else. Dale mentioned in her comment that her father was at Carrolup. I wrote to her and we continued communicating via Facebook. Dale wrote some powerful words that touched my heart. She talked about how she had gone to see The Herbert Mayer Mayer Collection of Carrolup Artworks at John Curtin Gallery with her father in 2015. Warrick was related to Barry Loo and Dale thought that when he saw Barry’s drawings it ‘gave him back some of the sense of belonging and connection that they had tried to erase when he was taken.’ I’ll write more about my conversation with Dale in a forthcoming blog. Soon after Dale appeared in my life, Cheryle Jones popped up too. She told me that she was first cousins to Dale and Wazza, and that her mother, Mildred Jones, was at Carrolup. I sent Cheryle copies of two documents I had on which were her mother’s name. She then told me the names of four siblings—Louise May Jones. Jennifer Rae Jones. Leslie Graham Jones and Kerryanne Jones—who had been at Marribank, and asked if I had any information about them. I did not. I found myself in conversation with Murray and Paul Jones on the Sandgroper’s History page on the Sunday night before last. Vernon joined in. He told me that Murray is Ross’s nephew and Paul is Murray’s son. It’s a great pleasure to ‘meet’ these WA Jones’s and I hope I get to meet them in person some time. I also hope I can find out more of what happened in the lives of Warrick (RIP) and Ross (RIP) Jones and their families. Thank you, all you Jones’s, for our discussions. Much appreciated.